There is a good chance if you are reading this that you may very well be inclined to believe you have grout haze on your travertine. You may have even tried a variety of products to rid yourself of the problem and realized it is not as simple as some make it out to be. 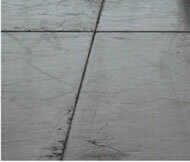 To begin with, while the term “grout haze” is thrown around a lot, there are many instances, where the problem is more than merely a “haze”. A “film” and a “haze” as far as removal are quite different. See the picture with travertine grout haze? In reality, that was a fairly significant film. There was no amount of cleaning the travertine that was going to eliminate the grout left behind from sloppy installers. 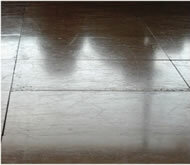 Is Cleaning Travertine Grout Haze A Solution? Indeed, the installers failed to do their job correctly. They should have been cleaning their sponges more frequently and keeping their pails of rinse water changed out frequently. Now the problem is on your back because someone did not supervise them or follow-up on their work. The next picture is after we removed the grout film from the travertine. We had to use diamond abrasives and hone the travertine to removing the grout film on the travertine. A secondary benefit to our travertine honing process was it eliminated much of the blotchy appearance that was taking away from the beauty of the travertine. Thus, if you choose to heed the advice of some Internet posts, you very well may damage your travertine from improper cleaning products and waste a fair amount of time and money trying a variety of products that have little success of resolving the removal of the grout haze.